This is not your grandmother’s ideal retirement community. Or … is it? It is if your grandmother is really into yoga and hiking, and she doesn’t give a hoot for pickleball or badminton. That’s straight from the findings of After55.com’s survey of more than 700 people between the ages of 50 and 89. 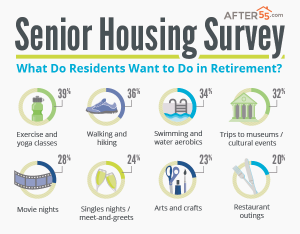 We asked our respondents, in a voluntary survey conducted online May 10-31, 2016, what activities they want in a senior living community – and where they want that community to be. What we found is that today’s seniors and soon-to-be seniors reflect their Baby Boomer upbringings and want an active retirement. They want exercise and yoga classes (39%), walking and hiking (36%), and swimming and water aerobics (34%). They also want to mingle! 24% of respondents favored singles nights and meet-and-greets as senior living activities. After working up a sweat exercising, respondents want some entertainment and culture. Favored activities were trips to museums and cultural events (32%), movie nights (28%), arts and crafts (23%), and restaurant outings (20%). Florida and California were by far the top two states for retirees. In fact, almost half of those surveyed (45%) reported that they are either already living in these states or plan to move to them in retirement. The largest age group among our respondents was 60-64, at just over a quarter of those participating. Women outnumbered men in responding to our survey in a 69% to 31% ratio. Only 18% of men and 15% of women responding currently live in senior housing, so what they want could shape the future of retirement communities. Those are just the highlights of our survey. Return to After55.com over the next few weeks, as we’ll be sharing more in-depth findings. Discover what people are looking for in retirement communities, and get advice on how to get the most out of senior housing.